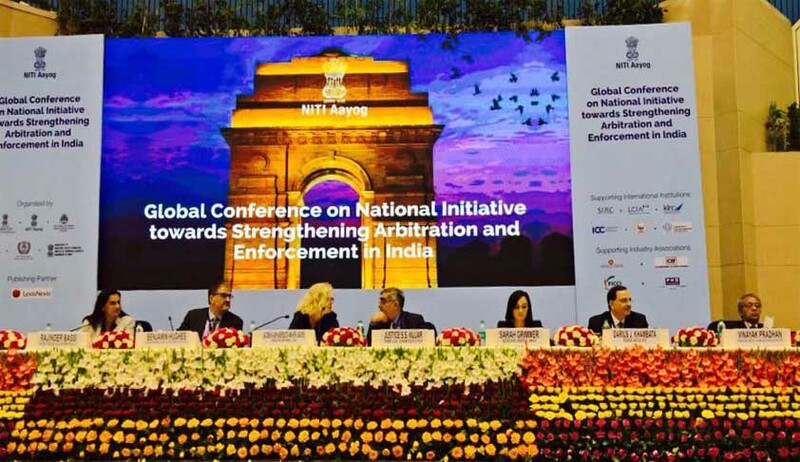 Organised by the NITI Aayog, law ministry, Department for Industrial Policy and Promotion (DIPP), National Legal Services Authority, and International Centre for Alternative Dispute Resolution, the global conference on “National Initiative Towards Strengthening Arbitration and Enforcement in India” began on October 21 at New Delhi.The President of India, Pranab Mukherjee, inaugurated the three-day conference. President of the International Chamber of Commerce, Alexis Mourre said,“India needs to be a partner to encourage arbitration in Asia and like Singapore and Hong Kong, there is enormous potential in India.” However, he also cautioned about Section 29A of the Arbitration and Conciliation Act 1996 as being a probable roadblock to arbitration in India. Arun Jaitley, Union Minister for Finance said, “World today looks at us. We need to have adequate infrastructure.” He also said that the object of Section 29A of the Arbitration and Conciliation Act 1996 is to expedite the disposal of arbitration. The provision of Section 45 were highlighted by CJI Justice T. S. Thakur that allow even multi-party and non signatory to the arbitration agreement refer to arbitration. The second day of the conference was replete with six panel discussions deliberating on the provisions of the act and bringing out the shortcomings that would need to be addressed for a successful arbitration mechanism in India. The first session focussed on setting up a world-class arbitration institution the speakers were unanimous on the fact that the parties to a dispute look for an independent, credible and neutral institution. It was suggested that India being a vast country could have multiple centres in metro cities. It was also discussed that there is need of a good framework, policy, eco-system and human capital to create world-class arbitration institution. Moderated by KK Venugopal, the second session dealt with the good, bad and ugly aspects of the arbitration act. During this session, it was pointed that India lacks a professional arbitration bar and trained arbitrators. Establishment of institutes that would provide training to arbitrators in India was also suggested. In the third session the panellists discussed the difference between common law and civil law and the approach under both jurisdictions. The issue of confidential arbitration was discussed and that when the parties go to court for seeking extension, the court’s order becomes public records, which is a serious concern for parties opting for confidential arbitration. It was pointed out that ‘too much judicial intervention is not looked well’. Enumerating the stages of Arbitral award, the fourth session dealt with the issue of disobedience of the awards to be treated as contempt. It was cautioned that lack of discipline among the professionals might hinder the development of arbitration. The panellists suggested sensitisation of the judiciary from lower court level. For the creation of a world-class arbitration setup an outsider’s perspective is also important and for this the fifth session consisted of panellists academicians and professionals from other countries. Through the session the panellists highlighted that good arbitration institutions, role of judiciary and the government is essential for a successful international arbitration setup. While all perspectives were covered, the last session of the second day involved the stakeholders in form of businessmen and corporate leaders from organisations like FICCI, IndiGo Airlines, BHEL, NHAI and JK Tyres. With most disputes arising at the ground level, the panellists stressed for settlement of the disputes at an early stage at ground level. They urged that the judiciary should respect the commercial decision. The third day started with a session that featured the Chief Justices of India, Singapore, France, Hawaii, Bangladesh, Bhutan and Maldives. They discussed issues like delocalization of institutional arbitration, emergency arbitration, confidentiality and transparency. They also stressed on the need to keep the dialogue going and promote a community of advocates who practice in arbitrations. Prime Minister Narendra Modi along with Chief Justice of India, Minister of Law and Justice and Attorney General came for the valedictory event. He highlighted the steps taken by government to amend various laws and enact new legislation for speedy resolution of commercial disputes. Rajendra Beniwal is a lawyer practising in Supreme Court of India.